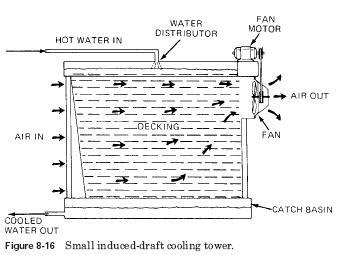 Classified air circulation method used, there are two types of cooling towers. They either natural or cooling towers. Fig. 8-15 shows the exploitation of natural draft cooling towers. Fig. 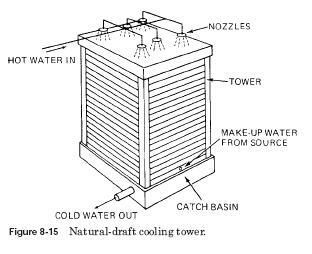 8-16 shows the operation of ventilation cooling towers. 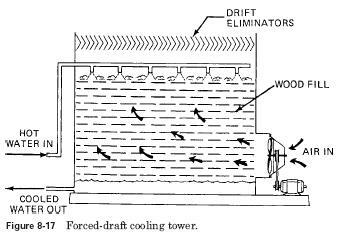 Draught cooling tower shown in Fig. 8-17 is just one example of the mechanical-draft designs available today. The tower ratings are given in tonnes. This is based on heat-capacity-250 Kj/(mintonne). The normal speed of the wind taken into account in the design of the tower-3 miles/h of wet-bulb Temperature as a rule, 80F (27C) for purposes of projecting. Normal flow of water through the cooling tower-4 l/min on each ton of cooling the best. Several graphs are available with the current design technology. 1. In t cooling tower must be rated at the same power as the capacitor. 2. Wet-bulb temperature must be known. 3. Water temperature at the outlet of the cooling tower must be known. It would be water temperature at the condenser inlet. Tower currently some maintenance problems. These stem primarily from the water used in the cooling system. Chemicals are used to control the growth of bacteria and other substances. Scale in pipes and parts of the tower also must be controlled. The chemicals used for each of these controls. Copyright @ 2009 - 2018, "www.ref-wiki.com"